Volkswagen recommend check at the first 60,000 miles and then every 20,000 miles (replace if necessary). The vehicle manufacturer has not recommended a timing belt replacement interval for this engine. NOTE: Volkswagen UK recommend the timing belt is replaced every 4 years. Camshaft locking tool (except ARC/ARR/AVY) – Volkswagen No.T10016. Camshaft locking tools (ARC/ARR/AVY) – Volkswagen No.T10074. Crankshaft pulley holding tool (except ARC/ATN/AUS/AVY/AZD/BCB) – Volkswagen No.3415. Crankshaft pulley holding tool (ARC/ATN/AUS/AVY/AZD/BCB) – Volkswagen No.T10028. Turn crankshaft clockwise to TDC on No.1 cylinder. Ensure timing marks on crankshaft pulley aligned  . If locating holes not aligned: Turn crankshaft one turn clockwise. Except ARC/ARR/AVY:  . Tool No.T10016. NOTE: Ensure locking tool(s) located correctly in cylinder head. PAS reservoir. DO NOT disconnect hoses. Except Polo Classic: Support engine. Except Polo Classic: Lower engine until crankshaft pulley bolt accessible. Except ARC/ATN/AUS/AVY/AZD/BCB – tool No.3415. Slacken crankshaft pulley bolt  . Fit two washers to crankshaft pulley bolt  . Fit crankshaft pulley bolt  . Lightly tighten bolt. Auxiliary drive belt guide pulley (models with AC). Turn tensioner pulley anti-clockwise to release tension on belt. Ensure timing mark on crankshaft sprocket aligned  . NOTE: Align ground tooth on crankshaft sprocket. Tighten tensioner pulley bolt finger tight  . Ensure baseplate is supported by bolt  . 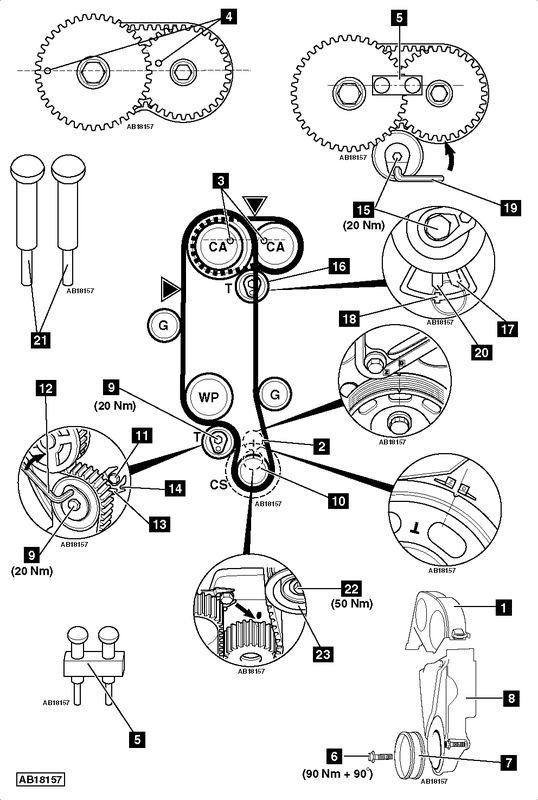 Fit timing belt in anti-clockwise direction, starting at water pump sprocket. Turn tensioner pulley clockwise  until pointer  aligned with notch  in baseplate. Tighten tensioner pulley bolt to 20 Nm  . Turn crankshaft two turns clockwise to TDC on No.1 cylinder. Ensure timing marks on crankshaft sprocket aligned  . Ensure pointer  aligned with notch  in baseplate. Apply firm thumb pressure to belt at . Pointer  and notch  in baseplate must move apart. Release thumb pressure from belt at . Turn crankshaft two turns clockwise to TDC on No.1 cylinder. New oiled crankshaft pulley bolt  . Tighten crankshaft pulley bolt  . Tightening torque: 90 Nm + 90°. Remove holding tool. Tool No.3415/T10028. Except Polo Classic: Tighten bolts securing engine mounting bracket to engine. Tightening torque: 50 Nm. Bolts securing engine mounting to body – 20 Nm + 45°. Use new bolts. Bolts securing intermediate bracket to engine mounting bracket – 40 Nm + 90°. Use new bolts. Bolt securing intermediate bracket to engine mounting – 50 Nm. Bolts securing engine mounting to body – 20 Nm + 90°. Use new bolts. Bolts securing intermediate bracket to engine mounting bracket – 30 Nm + 90°. Use new bolts. Long bolts securing engine mounting to body – 40 Nm + 90°. Use new bolts. Short bolts securing engine mounting to body – 25 Nm. Bolts securing engine mounting to engine mounting bracket – 60 Nm + 90°. Use new bolts. Remove timing belt as described previously. Turn tensioner pulley clockwise to release tension on belt. Fit drive belt in clockwise direction, starting at top of inlet camshaft sprocket. Turn tensioner pulley clockwise until pointer in position as shown  . Tighten tensioner pulley bolt finger tight  . NOTE: Ensure lug  in baseplate is located in cylinder head hole. Turn tensioner anti-clockwise  until pointer  aligned with lug  in baseplate. Fit timing belt as described previously. Turn crankshaft two turns clockwise to TDC on No.1 cylinder. Ensure timing mark on crankshaft sprocket aligned  . Ensure pointer  aligned with lug  in baseplate. Apply firm thumb pressure to belt at . Pointer  and lug  in baseplate must move apart. Good relief. Appreciated very much.